Sometimes there just isn’t a climax. 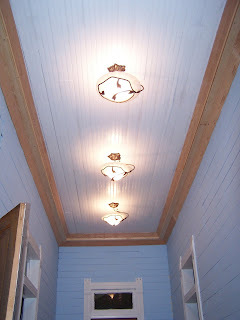 I finished painting the hall ceiling last night and installed the three light fixtures. Woohoo. I was expecting an immense sense of accomplishment, but I felt like I'd eaten ash. Maybe it's because the crown still needs to be stained? Maybe it's because I need to scrape the excess paint of the transoms? Or, maybe I need to paint the doors and install the cherry flooring? Whatever it is, I just can't get excited. As I polished off a midnight snack, I even indulged in some photo therapy. How is this for an extreme before photo? This is our hall rolling across Crow Mountain three-some-odd-years ago. The hall has definitely come a long way since then, but . . . I don't know. Maybe I just need some sleep? I think the crown molding getting stained will make a huge difference and offer enough contrast to make everything pop. 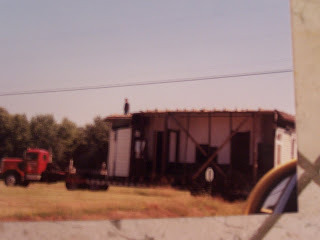 I think your house looks so incredible and look how far you've come in three years. You need to give yourself a pat on the back. Really. Wow, that really is some before picture! As Patricia says above, you've come a long way.